The weather has been much more spring-like these last few days, with a few days of sunshine, and nature is bounding ahead with lush green foliage. I’m even potentially going to need to cut my lawn again. Apparently there’s a ‘heat wave’ (by UK standards) next week. Although it’s chilly today, I headed to the shed with some more seeds, to get a few more sown. 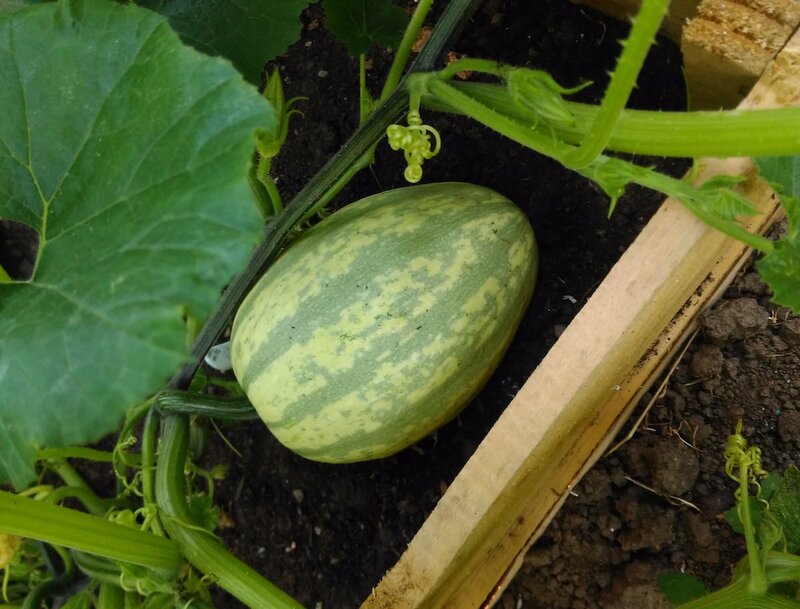 First up was my Squash ‘Spaghetti Stripetti’ – I grew this for the first time last year, and whilst it completely invaded my garden – grabbing every plant, twig, and blade of grass in the garden as it spread 20 feet, it gave me about a dozen big yellow squashes to eat. In fact, I’ve still got two in storage, and they seem fine. 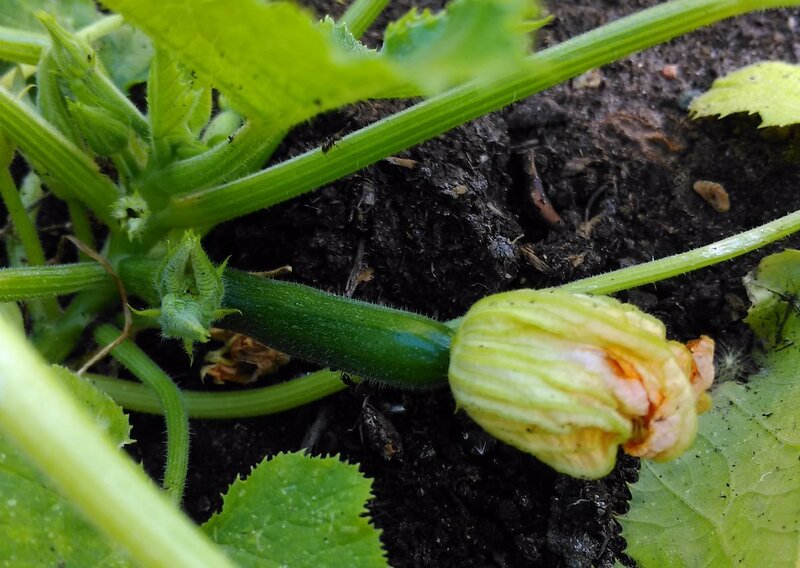 The first Squash ‘Spaghetti Stripetti’ early July 2017. My initial sowing last year saw me grow two, but after one being snapped by wind within hours of putting it out, and a second one being re-sown, it was really only the one surviving original plant that I needed – and it took over. This year, I’ve sown just one seed on its edge (apparently helping to avoid it rotting off when being watered from above) in some multipurpose compost. I expect this to germinate in just a couple of days. This is joined by 3 Courgette ‘Zucchini F1 Hybrid’ seeds. This is the first time I have grown this variety, as I’d always stuck to growing the ‘Black Beauty’ type, but let’s see how this one gets on. Last year, I sowed 6 plants, and had a total glut of 45 courgettes weighing in at more than 15.5kg. Whilst I’d like some courgettes, I don’t think i’ve eaten a single one since the end of last year! I like nasturtiums, but have had trouble growing them in the past. Their bright yellows, oranges, and red flowers, with their greeny-blue waxy leaves attract a lot of useful insects into the garden – namely the hoverflies – which can then help address any aphid issues. Sadly, they also attract the Cabbage White Butterfly, and their caterpillars can demolish a soft and tender nasturtium plant in a few hours. 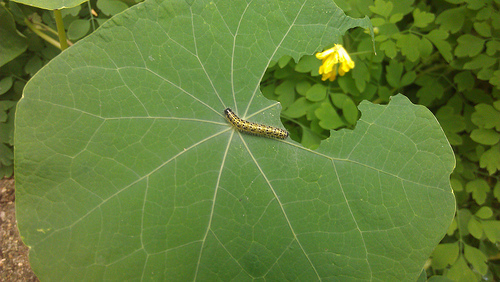 Caterpillars soon much their way through Nasturtiums. I’ve found an older packet of Nasturtium ‘Whirlybird Mix’ seeds, so I’ve planted a dozen of these, hoping that at least a few will make it up out of the compost and eventually into the garden where they can climb and flower, bringing in those important hoverflies, without getting gobbled up too quickly by caterpillars. Thanks again for reading, and I hope that you’ve had a happy weekend of gardening.